DAWN to DUSK DAYTIME MOISTURIZER with Sun protection is an extremely effective daytime facial Moisturizer with a gentle sunscreen combination for added protection. It is a completely non-comodeogenic and non- irritating formula that gently moisturizes dry skin while protecting against the suns harmful rays. Active Ingredients : octyl methoxycinnamate 4%, avobenzone 3%. Other Ingredients : Certified Pure Emu Oil, Distilled Water, Allantoin, Sodium Hyaluronate 1%, Vitaminfacial Moisturizer A, dL Panthenol (Vitamn B), Vitamin C, Vitamin D, Vitamin E, Veegum Ultra, Cetiol HE, Isopropyl Myristate, Polawax A31, Cetyl Alcohol, Glyceryl Stearate, Peg 100 Stearate, DEA Cetyl Phosphate, Benzyl Alcohol, Dermosaccharides SEA, Oceagen. 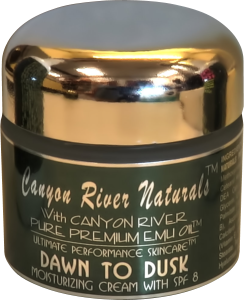 Note : Our blend of oils in addition to our unique Emu Oil processing technique, provides a high concentration of myristic, palmitic, palmitoleic, stearic, oleic, linoleic, and alpha linolenic fatty acids for extra healing and repair.